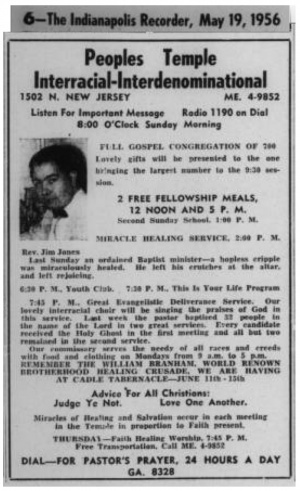 Some people refer to the followers of William Branham as "Branhamites" or members of the Branham cult. But is the message really a cult? 1 What is a cult? 2 How do cult members act? 6 Are William Branham's teaching in opposition to Biblical Christianity? Learn more about The Message. Cults either ignore the Bible altogether, or they say, ‘Ah yes, the Bible gives us the truth, but if you really want to understand the Bible, you must interpret it in the light of this revelation which has come to us’. In speaking thus, of course, they resemble Roman Catholicism which also claims this extra authority, this extra understanding, this further revelation. And in practice, whatever lip-service they may pay to the Scriptures, the real authority is this other... this extra... this new... this direct revelation that has been given. How do cult members act? It's quite common for the followers of William Branham to claim that he simply pointed them to Jesus Christ. But if this is true, why does the focus remain on William Branham? In fact, why is he still in the equation at all? If a preacher or an acquaintance shared the Biblical Gospel with you, leading you to Christ, this person would simply be a sign post pointing you to Biblical salvation. They would not be an integral part of your walk with God. William Branham's followers claim that he was just a sign post pointing them in the right direction, yet they deem him necessary in their walk with God. If William Branham is essential in your walk with Christ, he didn't truly point you to Christ, he pointed you to himself and claimed it was Christ. He didn't point you to the Bible, he became your Bible. Anything between you and God is an idol. William Branham perfectly fits the description of an idol and his follows are oblivious to it. This is the silent deception within a cult - the Cult leader is essential to his faithful followers. Everything revolves around him, not Jesus Christ. Every "truth" comes directly from him, not your Bible. This is one of the subtle powers of spiritual abuse. Even in the face of blatant Scriptural error, cult members cling desperately to their cult leader. They refuse to consider that something might be amiss in their paradigm of Christianity. They cannot bear the thought that their "prophet" might have lead them astray. Why aren't William Branham's followers willing to consider all the facts proving him wrong? The spiritual paralysis of the message movement makes it very difficult for them to look into the issues with his teachings. These issues are not simply a slip of the tongue, these are serious issues that must be addressed, i.e., lies, fictitious vindications, failed prophecies, unscriptural teachings. Observing message believers attempt to justify the presence of everything "Branham" in their lives, without admitting he is an idol in their heart, is both sad and troubling. Sad because we fully understand the brainwashing that goes on in the message, and troubling because it's so difficult to break that cycle. Can you say goodbye to William Branham and move fully into Jesus Christ? If not, then he did not truly lead you to Jesus Christ. It is clear that some followers of William Branham believe that he was Jesus Christ. Many followers of William Branham put his sermons above that of the Bible because they believe that he was infallible. These groups would include most of the followers of Joseph Branham. ...I have never put Brother Branham's teachings above the Bible! He told us that the Bible is our absolute and that is what I believe. Do you believe that William Branham was one of the greatest prophets of all time? Do you believe that as the seventh angel, William Branham could not make any significant doctrinal errors because the purpose of his ministry was to reveal all of the hidden mysteries of God? Is there anything that William Branham taught that disagreed with the Bible? Do you believe (as William Branham taught) that the only true evidence of the baptism of the Holy Spirit is believing the Word for your hour? This refers specifically to the teachings of William Branham. As a result, if you think that William Branham's message has any significant errors, to a message believer this proves that you don't have the Holy Spirit. But if you believe what William Branham taught, then you have the baptism of the Holy Spirit. Do you believe that "the message is Jesus Christ"? If you answered "yes" to any of these questions, you are actually putting William Branham's message above the Bible, whether you admit it or not. How can we say that? Virtually all message believers will state that William Branham was one of the seven church age messengers and, therefore, at least the equal of Paul the Apostle. In addition, they generally believe that his ministry as the Seventh Angel puts him in a league above all the other church age messengers. This statement in and of itself is puts William Branham's message above the Bible. A message believer does not have the option of disagreeing with William Branham, except possibly in respect of a relatively few minor issues. If presented with a clear teaching in the Bible that disagrees with William Branham, message followers will always accept William Branham's teaching and never that of the Bible. As a result, it is clear that followers of William Branham hold his teachings above that of the Bible. Anyone that exalts William Branham or his message above the Bible goes against God himself. In a well known racist diatribe, Donny Reagan, the pastor of Happy Valley Church of Jesus Christ, stated publicly in a sermon that if Moses was alive today, he would have to follow William Branham's message. This comment clearly shows that Donny Reagan holds William Branham's message as superseding the Bible. He specifically makes this comment in respect of William Branham's teaching that biracial marriages are contrary to God's plan. But what does the Bible say about biracial marriages? A Cushite is from Cush, a region south of Ethiopia, where the people are known for their black skin. We know this because of Jeremiah 13:23: "Can the Ethiopian [the same Hebrew word translated "Cushite" in Numbers 12:1] change his skin or the leopard his spots?"" God says not a critical word against Moses for marrying a black Cushite woman. So according to the Bible, there is no proscription on biracial marriages. William Branham preached against them. Donny Reagan's comments thus prove that he holds William Branham's message as a higher authority than the Bible. If you believe the message of the Bible, and the present Message of the day, a vindication of It; the reason you are sitting here, because you were predestinated to set here. You wouldn't have been here, otherwise; you would have been on the street, maybe drunk, some of you; and some of you out here and running around with some other man's wife; and you women out, married, and running around with some other women's husband, or something like that. See, but you were predestinated to be here. See, you can't help it. You have a Father, He is God, and you were a seed. Are William Branham's teaching in opposition to Biblical Christianity? We believe that some message believers are Christians. This is because some message churches do believe in and teach the substitutionary sacrifice of Jesus Christ as the only means for the forgiveness of sins. However, that does not mean that the message represents true or restored Christianity. To the extent that William Branham preached doctrines that agreed with the Bible, his teachings are acceptable. However, he did disagree with true Biblical Christianity in a number of significant areas. If your wife cuts her hair, you can divorce her. John never wept because there was no one worthy to open the book- he was weeping for joy. In some of his teachings, his view of the Godhead seems to be a form of modalistic monarchianism. As a result, many message churches effectively espouse the "oneness" view of the Godhead. But some of his teaching also leans toward an Adoptionist view of the Godhead. Followers of Lee Vayle's have essentially espoused this view (which some refer to derisively as the "Twinity" doctrine). Again the answer is "YES", William Branham's teachings contain significant Biblical errors. As a result of the above, it is clear that "message believers" are members of a cult. But if you've sold your inheritance, if you sold out and done these things… What am I saying? Return back. If you joined up with some cult that tries to keep you away from fellowship with other brethren, leave the thing. This is jubilee. Amen. I feel religious. Return. Return. This is jubilee. Don't let it pass by. Remember, don't let it pass by. There had to come forth, must come forth; God ordained it so, that there must come forth, them Seven Seals must be opened. It was supposed to be done in this Laodicean age. And I think, beyond any shadow of doubt… Not as we brag; we have no brag, only on Jesus Christ; none of us. We only brag on Jesus Christ. But we are thankful with the… for the privilege of knowing by any… beyond any shadow of doubt, God has chose us in this last days, and has proven it by the signs in the Heavens and in the earth; and every one of them coming right straight back to the Word, to prove that it's so, this age that we live in, the Message and how It is. We're not a cult. We're not a bunch of fanatics. We are servants of God, that's been called by the Holy Ghost. You'll have all kinds of names tacked to you, but that don't mean it's so. ↑ Robert A. Morey, How to Answer a Mormon: Practical Guidelines for What to Expect and What to Reply When the Mormons Come to Your Door (Minneapolis, MN: Bethany House, 1983), 12–13. ↑ David Martyn Lloyd-Jones, The Christian Warfare: An Exposition of Ephesians 6:10–13 (Edinburgh; Carlisle, PA: Banner of Truth Trust, 1976), 128. ↑ The Holy Bible: English Standard Version (Wheaton: Standard Bible Society, 2001), Ps 138:2.